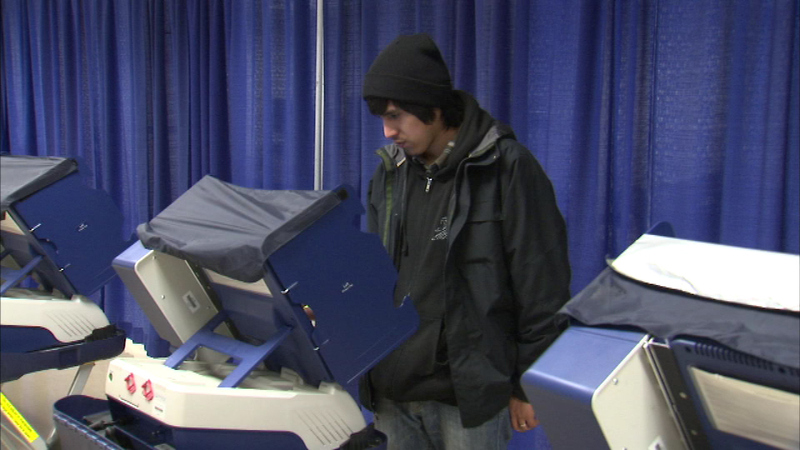 CHICAGO (WLS) -- Early voting for the upcoming April 7 runoff elections began on Monday and it was a record day. The Board of Elections said nearly 8,000 people cast their ballots on Monday. That's the most ever cast on the first day of early voting. Chicago Board of Elections officials said early voting will be offered at 51 sites from March 23-April 4. Voter registration services will be available at each site, which will be open Monday-Saturday 9 a.m.-5 p.m. and on Sunday 9 a.m.-3 p.m.
6th Ward - Whitney Young Library 7901 S. Dr. Martin Luther King Jr. Dr.
7th Ward - Jeffery Manor Library 2401 E. 100th St.
9th Ward - Palmer Park 201 E. 111th St.
10th Ward - Vodak/East Side Library 3710 E. 106th St.
13th Ward - West Lawn Park 4233 W. 65th St.
19th Ward - Mount Greenwood Park 3721 W. 111th St.
20th Ward - Coleman Library 731 E. 63rd St.
22nd Ward - Piotrowski Park 4247 W. 31st St.
23rd Ward - Clearing Library 6423 W. 63rd Pl. 24th Ward - Douglass Library 3353 W. 13th St.
34th Ward - West Pullman Library 830 W. 119th St.
41st Ward - Roden Library 6083 N. Northwest Hwy.